Aldi Novel Adilang said that, when it didn't rain for days, "I had to soak my clothes in the sea, then I squeezed and drank the water"
In this undated photo released by Indonesian Consulate General in Osaka, 18-year-old Aldi Novel Adilang is seen on a wooden fish trap floating in the waters near the island of Guam. 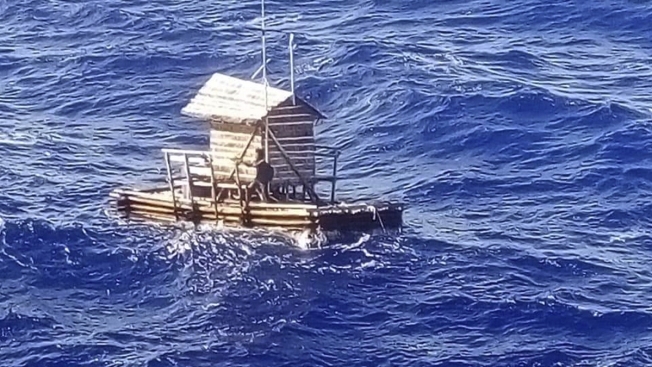 The Indonesian teenager has survived about 7 weeks adrift at sea after the floating wooden fish trap he was employed to mind slipped its moorings. Aldi's parents and the Indonesian Consulate in Osaka, Japan, said he was rescued by a Panamanian-flagged vessel off Guam on Aug. 31 and returned to Indonesia earlier this month. Aldi Novel Adilang told The Associated Press on Monday that he turned on a lamp every time he sighted another ship and can't remember how many passed by "unaware of my ordeal." The Indonesian Consulate in Osaka, Japan, says the 18-year-old was rescued by a Panamanian-flagged vessel off Guam on Aug. 31, about 1,200 miles from his original location, and returned to Indonesia with officials earlier this month. He was employed since age 16 in the one of the world's loneliest jobs: lamp lighter on a rompong — a wooden fishing raft with a hut on top — moored about 125 kilometers (78 miles) off the coast of North Sulawesi. The coastline is not visible from the fishing rafts and the numerous rompong are miles apart from one another, said Adilang's mother, Met Kahiking. Supplies are dropped off to the light keepers about once a week. "I was on the raft for one month and 18 days. My food ran out after the first week," said Adilang. When it didn't rain for days, "I had to soak my clothes in the sea, then I squeezed and drank the water." The teen's father, Alfian Adilang, said the family is overjoyed at his return but angry with his employer. The rafts are anchored with ropes and Adilang said strong friction caused them to break. "I thought I will never meet my parents again, so I just prayed every day," he said. The MV Arpeggio, which rescued Adilang off Guam, contacted the Indonesian mission in Osaka when it docked and officials collected him on Sept. 6, the Osaka consulate said in a statement. He returned to Indonesia on Sept. 8.